My 10 year high school reunion was this past weekend. How did I get this old? I chose not to go. 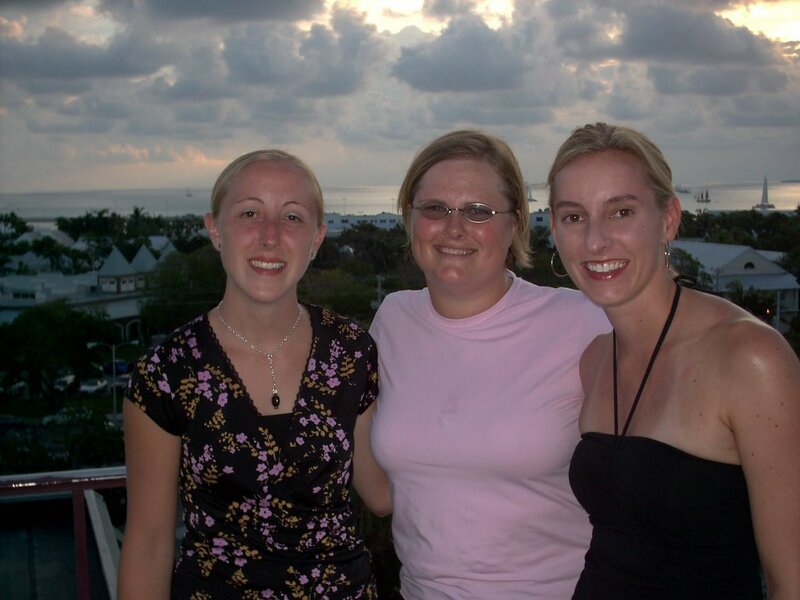 Luckily my two best friends from high school didn't want to go either, so we went to Key West over Labor Day weekend instead, and believe me, it was a hundred times more fun than a stupid reuion could have been. That's us on top of La Concha hotel. The way I see it, if there was a person from high school that I really wanted to contact, I could surely find them. There aren't many. I don't need to spend $85 to go and socialize at the freaking Sheraton in Westport. Please. And there was an invitation to go to the class president's church on Sunday, then have a family picnic in Queeny Park. I'd rather poke my eyeballs out than go to church with my high school class. They sent out this stupid questionnaire so they could make a book, I guess. We had to say who our biggest crush was, our best friends, best memories, etc. Gag. I don't even want to think about that stuff about myself, why would I want to know these things about my classmates? I can't even remember half of them. I looked through my yearbook recently, and seriously, half of them aren't even vaguely familiar. I figure my class was either way too big, I was a huge snob, or the drugs are finally kicking in. Probably a combo of the three. Plus, one of my best friends from high school and college died this year. She hated everything about high school, during and after. It didn't seem right to be there without her, though I'm sure she probably wouldn't have gone. It wouldn't have been right to make fun of everyone without her there to chime in. I guess I wish I could have gone and been a fly on the wall, but to have to actively participate - make small talk, pretend to care - that's just too much work for a Saturday night.